1. Combine lentils, white beans, egg, coriander and spices in a blender and pulse until a semi chunky paste forms. 2. 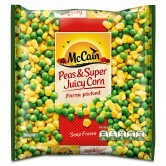 Transfer mixture to a large mixing bowl, add McCain Peas and Super Juicy Corn and quinoa or rice. Mix until well combined and place in the fridge for one hour to allow the mixture to firm up and become easier to handle. 3. Heat the fry pan or BBQ to a medium-high heat and lightly coat with oil, form the pattie mixture into 4 even portions and cook for 8-10 minutes or until golden and cooked through. 4. Serve patties on a roll with your favourite sauce and salad. 5. Serve with a side of McCain Sweet Potato Chips. 1 Combine lentils, white beans, egg, coriander and spices in a blender and pulse until a semi chunky paste forms. 2 Transfer mixture to a large mixing bowl, add McCain Peas and Super Juicy Corn and quinoa or rice. Mix until well combined and place in the fridge for one hour to allow the mixture to firm up and become easier to handle. 3 Heat the fry pan or BBQ to a medium-high heat and lightly coat with oil, form the pattie mixture into 4 even portions and cook for 8-10 minutes or until golden and cooked through. 4 Serve patties on a roll with your favourite sauce and salad. 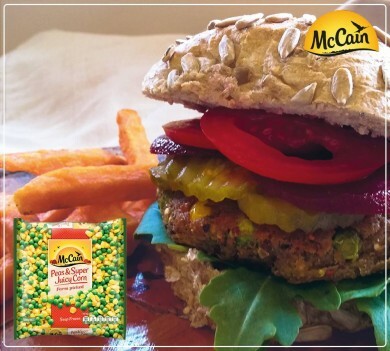 5 Serve with a side of McCain Sweet Potato Chips.